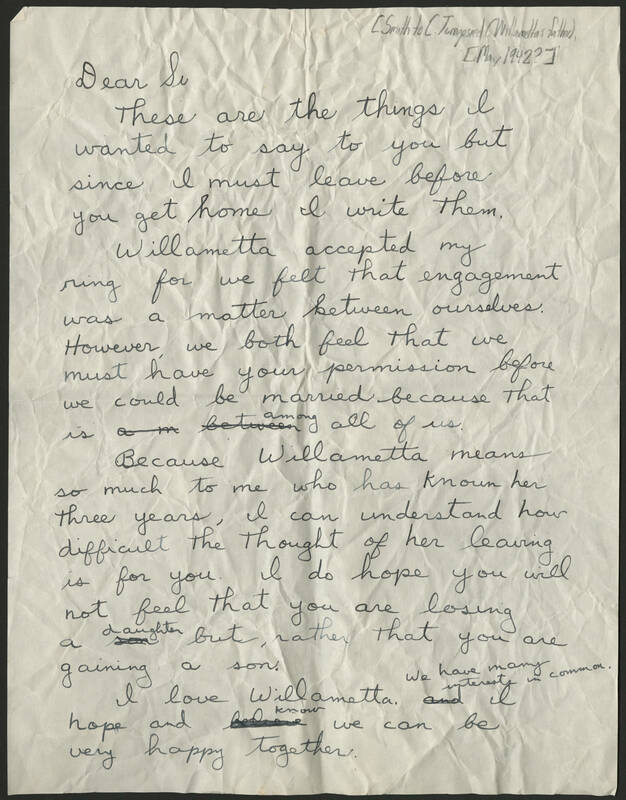 Burton Jay Smith and Willametta Turnepseed letters, 1942-1944? [Smith to (Turnepseed/Willamettas father) [May 1942?] Dear Si, These are the things I wanted to say to you but since I must leave before you get home I write them. Willametta accepted my ring for we felt that engagement was a matter between ourselves. However, we both feel that we must have your permission before we could be married because that is among all of us. Because Willametta means so much to me who has known her three years, I can understand how difficult the thought of her leaving is for you. I do hope you will not feel that you are losing a daughter, but rather that you are gaining a son. I love Willametta. We have many interests in common. I hope and know we can be very happy together.